How do you open a position by relying on candlesticks and without indicators? 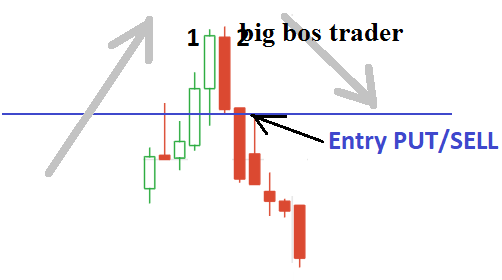 In this article we will discuss the techniques of how to trade binary options and forex using accurate candlestick patterns, namely the Bullish Engulfing and Bearish Engulfing Patterns. Many strategies to gain profit or win in trading, of course in analyzing the movements of each trader has a variety of ways. There are traders who prefer to use indicators and also those who are used to analyzing charts rely solely on candlestick patterns. On this occasion we will discuss how to analyze trading using only the candlestick chart. One of the most accurate and profitable candlestick patterns is the engulfing pattern. Engulfing patterns are often encountered in trending market movements. Many traders carry out open positions from engulfing patterns as a signal to enter the market. Besides being easily observed, the likelihood / accuracy of the engulfing pattern is quite high, especially in the trending market conditions. 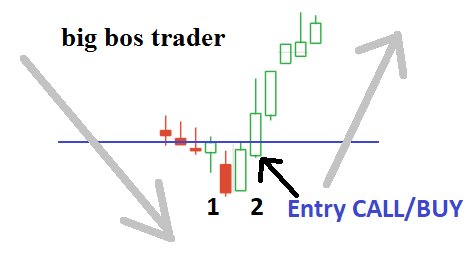 Engulfing patterns are formed from the formation of 2 candlesticks, of which the last candlestick "swallows" the previous candlestick with the shape of a longer candlestick body. Or simply means the shape of the second candlestick is longer than the previous candlestick, with the two candlesticks different colors (bullish / bearish). Engulfing patterns will be more accurate if the second / last candlestick has a short or no tail. This is because the shape of a long tail indicates unclear direction of price movements or consolidation tends to occur. In market movements that are trending the engulfing pattern indicates a reversal or reversal. This can be used by traders to take open trading positions. Then what is the strategy for reading candlestick engulfing patterns? Previously, make sure you know the type of formation of this engulfing pattern. Engulfing patterns consist of two different colored candlesticks. 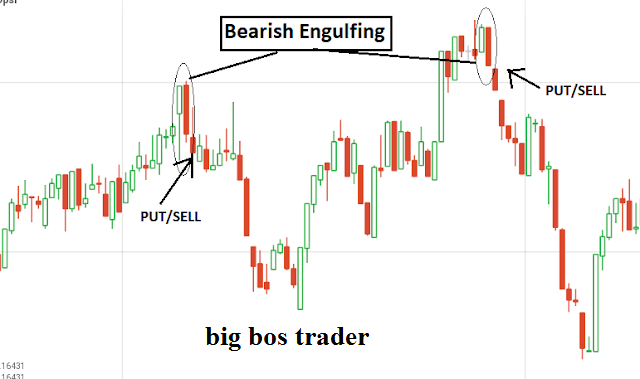 The bullish engulfing pattern is used for signal entry taking an open CALL / BUY position. In order for the signal results shown to be more accurate, make sure the market movements are in a trending state, not consolidated or sideways. As in the picture above, a bullish engulfing pattern is created from two candlesticks 1 and 2. The first candlestick (no. 1) must be a bearish candlestick or a doji candlestick. The next candlestick (no. 2) must be a bullish candlestick and must have a body longer than the first candlestick body. Open up position ie CALL / BUY after the second candlestick is formed. 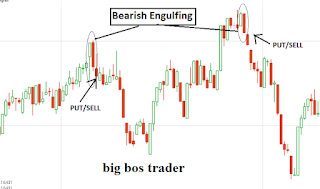 The bearish engulfing pattern is used to signal the entry of open PUT / SELL positions. This pattern must occur in market movements that are trendy or trending rather than sideways or consolidations. The first candlestick (no. 1) must be a bullish candlestick or a doji candlestick. The next candlestick (no. 2) must be a bearish candlestick and must have a body longer than the first candlestick body. Open up position namely PUT / SELL after the second candlestick is formed. If you want a more accurate signal, you can combine the candlestick pattern analysis above with the CCI indicator. It's easy to recognize the appearance of this engulfing candlestick pattern, even for beginners. 0 Response to "Strategies and Trading Techniques with the Most Accurate Candlestick Engulfing Pattern"